Homemade Broth – Everything You Ever Wanted To Know! Fair warning: This is a long post. But I’ve helped several friends journey into the abyss that is broth, and sooner or later, these are the questions they ask. I don’t like to simply say, “This is what you do, because I said so.” And like all recipes, everything can be customized to YOUR preferences. So this is a guideline. A starting point. I think everyone should make their own broth. Both for the nutrition benefits and the cost savings. Well, and the delicious flavor. I can’t imagine using store-bought broth in anything ever again! What’s the difference between broth and stock? Broth has meat, stock doesn’t. I’ve made it both ways, and prefer the flavor meat gives, so I generally make broth. But feel free to make this recipe your own! I’m a huge believer in the nutrient benefits a person gets from cooking bones. When I make broth, I generally use mostly bones with just a little bit of meat thrown in. Maybe I’ll leave some meat on my chicken bones. Or maybe I’ll throw in a beef short rib. Or maybe I’ll use a soup bone. Sometimes I’ll even throw in some organ meats (kidney is my choice) for additional nutrient benefits. My point is, when I make broth, I’m using 95% bones, 5% meat. And I use vegetables and spices for flavoring. The goal is to have a broth that’s nutrient dense, after pulling all the fantastic stuff from the bones. So what do these bones have to offer? Gelatin and collagen – Gelatin helps soothe and heal your gut. If you have any stomach issues, the gelatin in broth will help. Gelatin and collagen also help with hair growth, skin elasticity and strong nails. Glucosamine – Helps with joint pain and inflammation. Calcium, magnesium and phosphorus – Helps with bone formation and repair. Glycine and proline – Amino acids that are anti-inflammatory. And in today’s world, we need as much anti-inflammatory as possible. And it’s said to help with the immune system before and during sickness. When I’m sick, there’s nothing that tastes better than some broth. Similar to chicken soup when you’re sick, but so convenient to thaw some frozen broth and drink it, especially when it’s cool outside. So, what’s my recipe? Well, first, you need to realize to get the nutrients out of the bones, you need to cook them for a long time. I’ve made this recipe in my crockpot, cooking for nearly a day. Then I read that I could get the same benefits using my pressure cooker in a few hours (making a few batches). I’ve personally switched to the pressure cooker, but feel free to implement using a crockpot (on low – you’ll want to occasionally remove the lid to keep it below boiling) or stovetop (just below a simmer) for a day or so. The fancy thing to call this broth is “bone broth.” But I get a little annoyed with the pretentious paleo community (no offense, friends, I don’t think YOU’RE annoying, just as a stereotypical whole), so I’ve resorted to calling it just broth. Or even more commonly “broth or stock.” Theoretically you could call it beef or chicken broth, but often times I mix beef and chicken. And “meat broth” sounds weird. My point is, get sassy. Make it your own! *Important note: I make two batches in a 6 quart pressure cooker, which can be filled 2/3 full, which means four quarts. If you’re only doing one long batch with your crockpot or stock pot, depending on the size of the pot, you might want to adjust the amount of vegetables, and especially the salt. Make sure everything fits and the lid closes and everything’s covered with water. Broth really is an art. I started making broth about nine months ago. I made it every single week for a long time, and feel like I’ve just perfected what I prefer. Remember: It’s easier to add salt after the stock is made than to make it less salty. And everyone has vegetable preferences. I’ve added things like fresh spices and didn’t care for them. I LOVE the flavor of celery, onions and garlic, but don’t care as much for carrots. So this mix of vegetables is my preference. 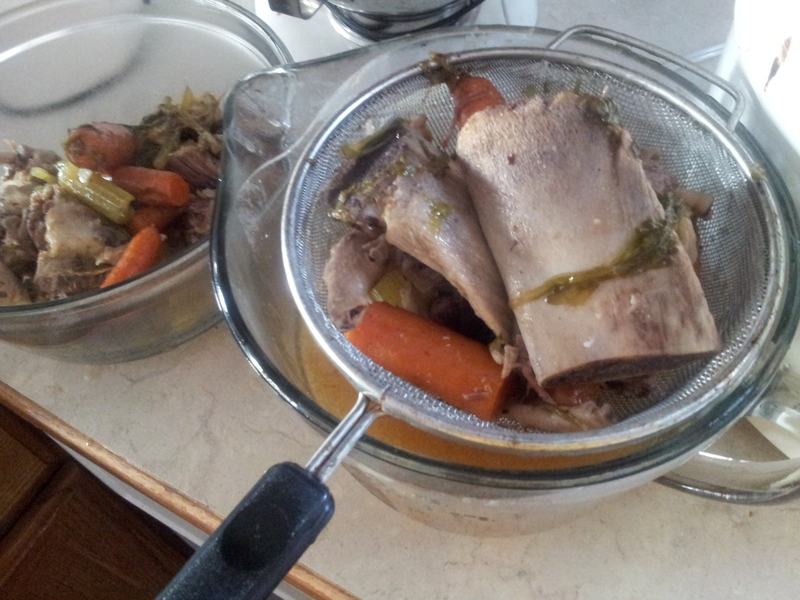 I always roast my beef bones before I put them in the broth. I’ve read the flavor’s better (I have done without, and honestly haven’t noticed a difference), and it kills surface bacteria (I am unsure how killing the bacteria in the oven is different than in boiling water). Anyway, I have always done it this way. I generally roast the bones (at 350-400 degrees) while I prepare my veggies). Watch the bones, some start to burn faster than others. You can flip the bones, or you can cook until they start to brown. You don’t need to put any fat or anything on them. Just stick the plain old bones in the oven. If I’m using any type of meat, I’ll also brown the meat. However, if I’m using chicken bones from a chicken I just cooked, I won’t bother re-browning these bones. I put the bones at the bottom of my pressure cooker/crockpot. Then put the vegetables on top. Then sprinkle on the spices. Since I’m making two batches, I will put all of the bones and half of the vegetables and spices in. I always use clean drinking water to make my broth. But that’s mostly because I don’t prefer the flavor of my tap water. If you’re boiling something, it’s going to be pretty clean anyway. So use whatever water you’d like. I fill my pressure cooker to the max fill line, or the crockpot or stock pot nearly to the top. Since the crockpot/stock pot is going to be simmering all day, you’ll want to leave some room so it doesn’t simmer over and make a mess. OK, here’s where there’s a slight difference. I used to do this step whether I was using a crockpot or a pressure cooker. But recently I’ve cut this step out if I’m pressed for time and am using a pressure cooker. Bring your bones to a boil. Before they start to boil, this white stuff will come to the top. Skim this off. 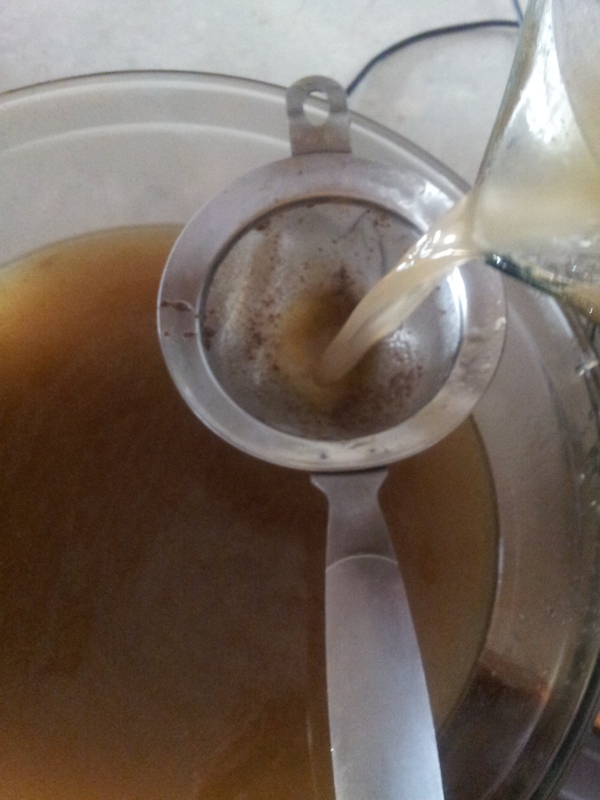 This is supposed to remove the impurities and make for a clearer looking broth. When I made pho, I wanted a clear broth, so this step was worth it. And I ALWAYS skim the scum off when I use conventional bones. Now that I’m using higher quality bones, I don’t worry so much with a pressure cooker. If you want to see it, this is what the scum looks like. You simply lift it off with a spoon. Since the water’s hot, I usually use a long-handled spoon. I prefer the flatter ones, like something you dish out casseroles with. But whatever you prefer to skim it off, use it. You have to work fairly quickly with this step. There’s not a lot of time between when the scum starts forming and the water boils. I use a stovetop pressure cooker. After I started making broth and helping friends make it, I realized others use an electric pressure cooker. These instructions SHOULD work for an electric pressure cooker, but your results might vary. I put the pressure cooker on high until it builds up pressure and starts to steam. Then I turn the temperature down to about medium, which is as low as I can normally keep it and keep the steam coming out. I cook at medium for about 40-50 minutes. 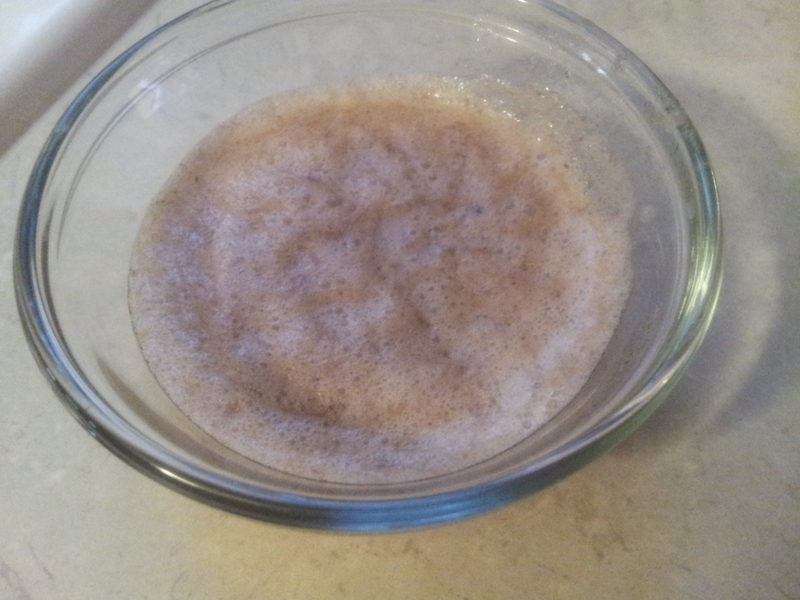 Then remove from heat and let the pressure release naturally (which is generally another 15 minutes). I have a two-step straining process. First I strain into a large strainer to catch all of the bones and vegetables. I like to put the first strain in a glass dish with a spout to make the second strain easier. I discard the vegetables – they can get mushy and bitter on the second round, and put the bones back in the pot. Then I run the broth through a much finer strainer to catch some of the grittiness. I let this sit on the counter while I start my second batch. First step in straining. I use a big strainer, and you’ll notice I’m straining into a container with a spout. This makes step two easier. 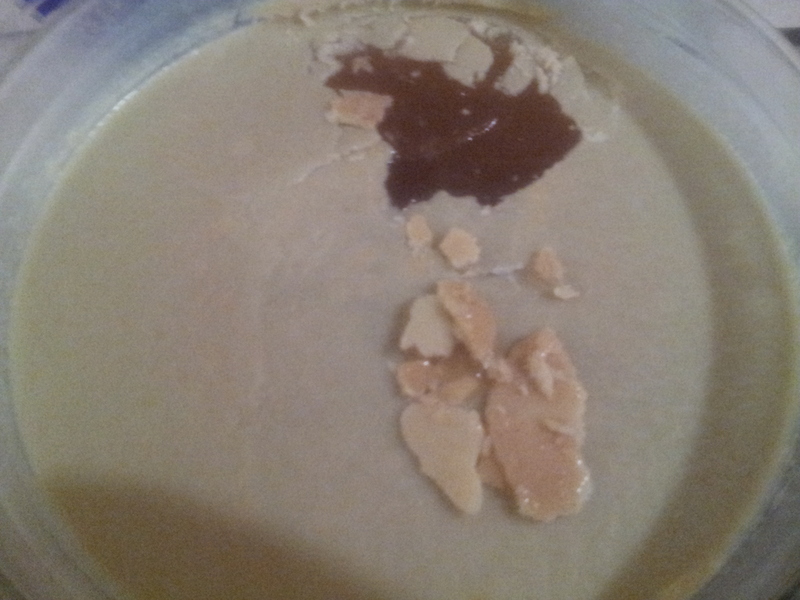 The second step of straining. Pour through a fine strainer. To the bones already in the pot, add the remaining vegetables and spice. And don’t forget the vinegar. Then fill with water. And cook the same way, on high until the pressure builds. Lower temperature to medium and cook for 40-50 minutes. Let the pressure release naturally. Strain twice. Don’t put your bones down the garbage disposal. I don’t have pets, but I’ve read that these boiled bones, because they’re fairly soft, aren’t good to give to pets. On the other hand, I’ve heard people say their dogs love them. I’d suggest research before doing anything that might harm your pet. The fat will rise to the top and form what some call a protective crust. So I usually put my warm broth in the fridge (in a glass bowl) with nothing covering it. Once I’ve broken the fat, I will cover it with plastic wrap. Now, here’s the fun part! 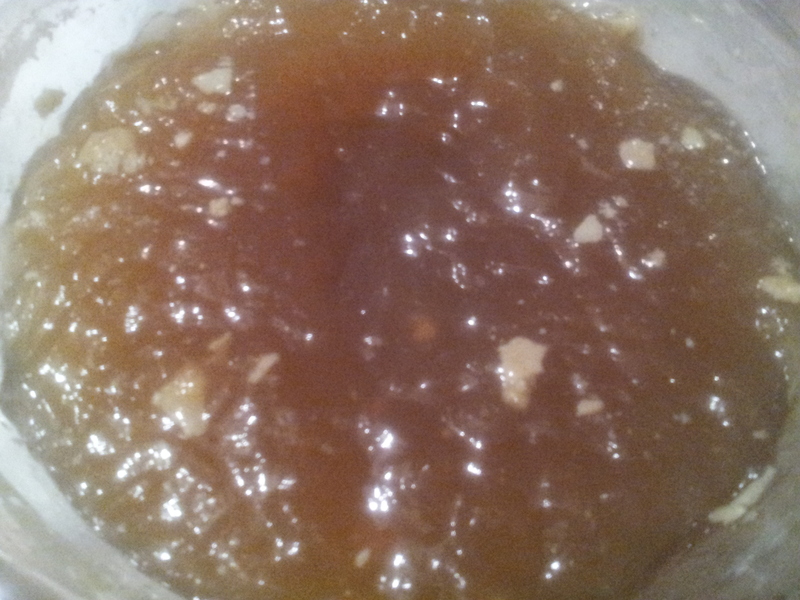 If you’ve used enough bones and haven’t over-cooked them, your broth will gel. Gel like Jello! I swear it’s broth magic. I don’t know why I’m so tickled. I think because getting a gel really is an art. You’ll notice the layer of fat I’ve peeled off to show what it looks like. If you add turmeric to your broth, this will be a bright yellow. This is a batch I made before I discovered the magic of turmeric. And it’s really hard to show what gelled broth looks like. This is some broth that gelled without any added powder gelatin. So you can see it’s possible to get a good gel (and a good amount of broth) without that extra investment. I ordered my beef bones from the farm where I got my 1/8th of a cow. I had them cut the bones into about 2” pieces. There are some smaller/thinner pieces, and there are some flat big pieces. I usually throw in a variety of bone sizes. Yes, I really do use chicken feet. It’s not as creepy as it sounds. They create a nice gel. If I haven’t cooked a chicken and don’t have a whole chicken carcass, I will sometimes throw in 5-6 chicken feet in each batch of broth (with the beef bones). Although I’ve never bought them separately, I’ve heard chicken backs and necks are cheap and good to use. I have only used ham bones occasionally, but once I get my half pig later this summer, I intend to also use pig bones. Another note on bones: Many butcher shops won’t know what you’re asking for if you ask for beef bones. If you’re buying a part of a cow, you’ll have to specify you want more than soup or marrow bones (the most commonly used bones). Most butcher shops also have oxtail packaged in their freezer section. But they’ll likely be happy to get rid of them. So specify you want “all of the bones, like shin bones, feet (not hooves), etc.” The butcher will generally cut them, so I ask them to cut them to 1-2” thickness. And they will usually package them in bags. I’ve seen bones priced anywhere from $1/pound to $5/pound. Before I found my great suppliers of grass-fed beef, I got a lot of my bones from an Asian market where they butchered their own meat. Asian cultures are known for using the entire animal, so they will have freezers and refrigerators filled with things you may not be accustomed to seeing. Often times they’d have bags of bones in the freezer section. And one market even had bones sitting out that you could bag yourself (in these cases, I ALWAYS roasted my bones and was careful to skim the scum off before the first boil). They were cut to great broth size. That’s where I usually bought beef feet, chicken feet and oxtail. And I would commonly pick up bags of bones (either pre-packaged or choose your own). I’d usually get them home and re-package them into broth batch sizes. For example, I’d put 6-10 chicken feet in a bag. Then I could pull out that bag and dump. Or I’d put a couple of beef feet together and wrap them in plastic wrap then put several in a freezer bag. The more organized you are, the easier it is. Now that I have tons of grass-fed beef bones, I just pick and choose from different bags. I will usually put one large, flat bone in the bottom of my pot, followed by 3-5 smaller beef bones. And if I have bones of a whole chicken I roasted, I’ll toss those in, too. I have asked Blessed Nation Farm about getting chicken feet when they butcher their batches of chicken, so hopefully soon I’ll have lots of good quality chicken feet! How do I store my broth? I normally keep it in my fridge for about a week. At that point, I notice the gel starts to undo itself and get watery. I’ve heard lots of people will re-boil their broth and stick it back in the fridge. But I generally portion into 2 cup portions in quart freezer bags. I push out as much air as possible, then store several quart bags in a gallon freezer bag. I’ve found 2 cups is perfect for adding to a dish that wants a cup or two of broth, or for a cup of broth when I’m not feeling well or am cold. I will also occasionally put a larger amount in a gallon freezer bag, and double-bag with another freezer bag. I double-bag to avoid freezer burn (plus, keeping the quart bags of broth together is convenient). Some people aren’t fans of storing in freezer bags, but I generally try to avoid warming the bags in the microwave. I’ll lay them on the counter to slightly defrost. Or will even cut the bag away. Well, that’s it! I think that’s all you ever wanted to know about making broth. The why, the how, the how long, the ingredients. What have I missed? Is it too overwhelming? Just get started. Don’t worry so much about making the perfect broth the first few times. Figure out what tastes best for you, and work toward a good gel. I will NEVER buy store broth or stock ever again! Oh, and for people who worry about recipes that call for chicken or beef broth or stock. Or even vegetable stock. I never worry. I use whatever I have in the freezer. I often times even replace wine in recipes with stock.